Tiwa Savage, and her husband, Tunji Balogun aka Teebillz are back in each other’s arms. It will be recalled that the once lovey-dovey couple washed their dirty linen in public sometime in April 2016, when the couple fell out big time. Teebillz, who claimed to be the brains behind Tiwa’s music fortunes, accused the singer of cheating on him with several artistes including Don Jazzy, 2face and Dr. Sid. He also blamed Tiwa’s mum for fuelling the crisis in their marriage. Tiwa did not just debunk the allegations, she also accused of Teebillz of being a habitual user of drugs , stealing her money and engaging in extra-marital affairs. However,it seems the couple has finally put the squabble behind them. According to a source close to the couple, family members from both sides have intervened in the dispute and have successfully brought about reconciliation. The hitherto estranged lovebirds have now buried the hatchet but not before Teebillz travelled out of the country where he underwent rehabilitation to help with his drug addiction. He returned to the country recently, and has been spending time with his son, Jamal. Also, he and Tiwa are back to living together. At media personality, Stephanie Coker and Olumide Aderinokun’s wedding, Tiwa and Teebillz were the centre of attention.Their first public appearance together since their well-publicised break-up, the duo only had eyes for each other. 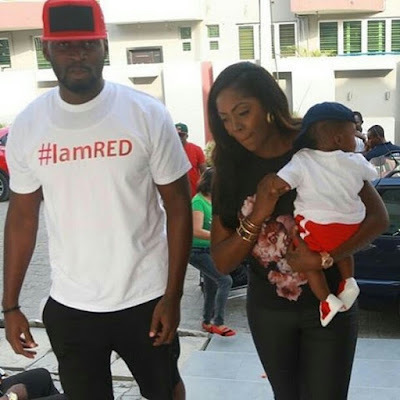 A besotted Teebillz could not keep his hands away from his wife’s waist. A source told PUNCH that the couple had been advised to keep their relationship off social media, and from the prying eyes of third parties. It was also learnt that while the couple was apart, Tiwa, reportedly purchased a house in Jos, Plateau State, where she went to cool off, at the peak of her marriage crisis. She fell in love with the cold and cosy environment in Jos and shelled out several millions of naira to purchase a house in a highbrow area of the Tin City.